Kick Buttowski and other Disney characters cross the finish line. As far as kart racing games go, Disney Super Speedway won't win any awards. 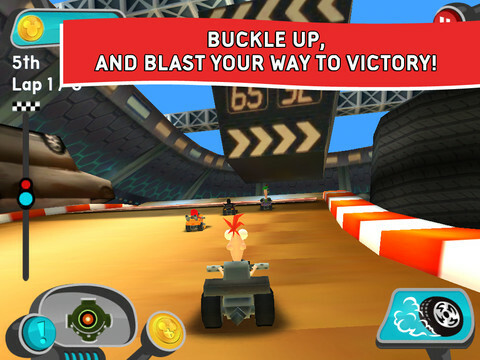 There's a noticeable lack of speed, the tracks look unimaginative and you won't find multiplayer modes. Of course, you can't expect much, given that it's free-to-play. That aside, one of the coolest features is the ability to buy power-ups during races, in addition to picking up items. This little wrinkle is just enough to make Super Speedway stand out. The fact that it stars characters from Disney Channel and XD Animated series doesn't hurt. To that end, fans will be able to play as heroes from Phineas and Ferb, Fish Hooks, Gravity Falls and Kick Buttowski, among others. None of them possess unique abilities, but at the very least, it gives youngsters a chance to pick favorites. On top of that, they don't ride signature karts. 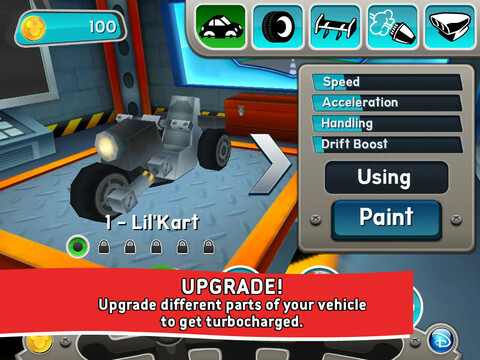 Instead, the game presents you with a standard-issue vehicle, and it's your job to make improvements using coins. By adding thrusters, scoops and other items, you stand to increase speed, acceleration, handling and drift boost. You'll need that and more because the races are surprisingly difficult, thanks in large part to the aggressive artificial intelligence that utilizes weapons (think mines and rockets) whenever possible. You'll be in first place most of the way, only to take damage and spin out of control, watching helplessly as the competition sends you into sixth. Of course, this is where purchasing items comes into play. At any point, you can tap an icon along the bottom left corner of the screen to acquire some random power-up. Ultimately, you want shields, as they grant temporary protection from enemies, but you can also combine items for different results. Let's say, a shield and rocket combo. We're also fans of Disney's decision to generously award players with coins for winning races and completing objectives. There's an option to make in-app purchases, but you don't need to open the wallet, and you can even toggle IAP on and off. None of this makes Disney Super Speedway the must have kart racing game of 2012, but at the very least, it's a brief distraction, and a welcome one if you or loved ones watch the shows. If Disney ever decides to create a more full-featured effort, it has a decent foundation with which to build. What's Hot: Easy to amass thousands of coins, decent collection of characters from Disney shows, buying power-ups during races, combining said power-ups, upgrading karts. What's Not: Simplistic graphics, boring tracks, cheap A.I. opponents.